The annual Second Harvest Foodbank Share Your Holidays campaign in Madison, Wis., was again a huge success — thanks in part to many TDS employees! From selecting Second Harvest as the charity of choice, to the phone system donation for the event’s grand finale and the food collection, TDS contributed 17, 577 meals this year! 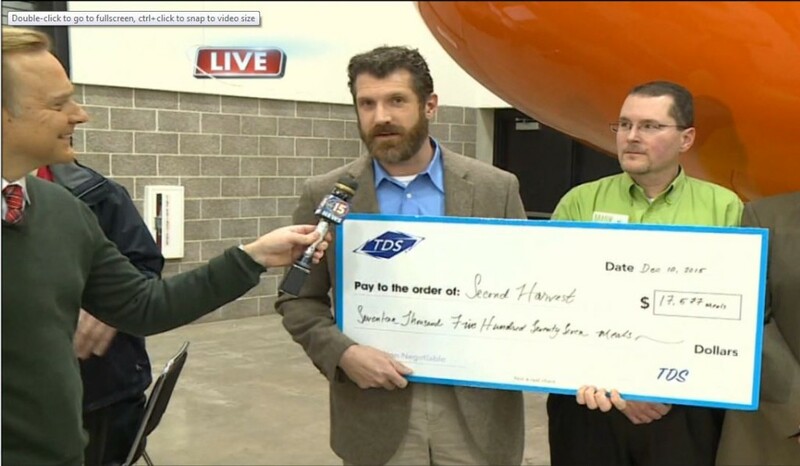 Check out the photo of Matt Ivens., Market Manager, presenting the check during the live during the NBC15 live newscast. All-in-all, the event achieved its goal raising more than three million meals! 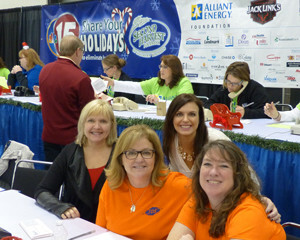 Numerous groups of employees volunteered to help answer phones and sort food during the event’s grand finale, including (from left to right): Suzanne C., Paula D., Angela G. and Jodie L.
Dean S. was a rock star for getting everything connected and ensuring the phones would ring during the entire phone-a-thon! Other TDS employees and teams were also actively involved in helping make the event happen including: Mark F., Field Service manager, and his team; Jodie L., Account Manager; Sharon J., Field Service Tech dispatch; and Jackie D. and her team. In Northfield, Vermont, employees are once again volunteering as Angels to help the local CERV (Community Emergency Relief Volunteers). This year 10 employees are fulfilling 14 Angel’s wishes. “It’s something we’ve been doing for many years,” said Peggy S., Senior Accountant. Santa made his annual visit to Monticello, Minnesota last weekend. TDS teamed up with the Community Center to capture every child’s visit. In fact, TDS provided printed pictures to every family — more than 200 pictures in all. 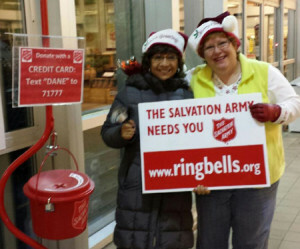 Karla S. has been volunteering with the Salvation Army for 15 years, helping with the La Center, Washington Red Kettle Campaign. In the holiday spirit, TDS employees in Pequot Lakes, Minn., are helping a fellow employee and his family. Just before Thanksgiving, Brad W., a senior advisor on the Repair Team, suffered a brain aneurysm. He’s been in the hospital ever since.